I’m presently re-reading a book I originally loved back in 2002. 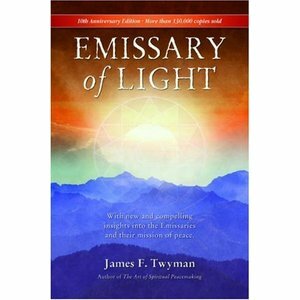 Emissary of Light by James F. Twyman has a message I resonate with – that humanity is ready to step into a larger role, one in which we accept our next step on the evolutionary ladder and transcend the mind that creates conflict and war. Most of the true story takes place in the war-torn former Yugoslavian state in the summer of 1995. The following words are from a dialogue in the book between Jimmy Twyman and Duro, an associate of the Emissaries of Light. These are Duro’s words. I’ve added the bold type. “All through history humanity has been in conflict. The conflict reveals itself in every relationship, including between large groups of people. When this feeling of conflict becomes great, nations go to war. The fighting kills thousands, or millions. . . . Conflict in the world is the result of conflict within us. We project that feeling into the world because we are not ready to accept that we are the cause, and therefore the solution, to that conflict. Thus wars have raged in the world since the beginning of time, because we were not ready to deal with the conflict where it really is, within us. “For thousands of years there has been a secret society whose responsibility it was to give humanity the chance to mature. This society has always existed near a place in the world where the conflict is greatest, in a country or area experiencing the most hatred, greed, and war. This is because the power of their work is greatest when it dissolves conflict from the center, or from the place where it is thickest. These people therefore live silently, invisibly, without ever being noticed, in the center of despair, in the middle of conflict.. There work is not seen by the world. It is a spiritual work, its function being to extend the magnificence of Divine Light through the world. In this way they inspire peace, they give hope and instill the desire for forgiveness. Wars end, people and nations learn from their mistakes. Each time, humanity comes a little closer to accepting the truth of creation, that peace and conflict both reside within, and it is only there that it can be resolved, experienced, and lived. This community, called the Emissaries of Light, will continue to exist in areas of extreme conflict until this has happened. Then it will not be needed. Emissary of Light is an inspiring read. I recommend it for anyone wishing to aid in the healing of conflict—within and without. It’s a page turning story that invites you to revisit certain pages, to go a little deeper into the positive messages each time. The following selection is from page 140 in the chapter titled ‘The Gift of Love.’ These words are from the emissary Jimmy Twyman calls Teacher, the one who sits in the middle of the other twelve emissaries and who gathers and concentrates the rays of energy coming from the others into one magnificent beam of brilliant white light. “The final lesson is about the true meaning of love. I have said before that fear is the self-imposed block to the awareness of love’s presence. When fear is released, love is revealed. And yet the true experience of love is beyond anything you can now imagine. It is beyond the thought or the idea of love. It lies past all the images and symbols you have made to obscure love’s call. And yet it is closer than you know, closer than your breath or even the silent whisper of love’s longing for itself. And what is the secret that love has whispered into your half-closed ear, the distant echo that has haunted you so? Only this: You are the very essence of Love. This very moment, just as you are, in spite of all the preconceived ideas you have of yourself, love claims and accepts you. “You have forgotten who you are because in your fear of losing love you have withheld that which is your foundation. Love by its very nature is a gift that is freely given. And yet this gift is known only as it is given again. Only when love is breathed from one heart to another is it fully experienced. When love is withheld it is forgotten, and because you and love were born together, you are forgotten with her. She lies hidden within you beside the still forgotten memory of your truest Self. Though asleep and dreaming, she awaits the dawn when her name is called and she is again brought back to life. And the awakening of love is your awakening as well, so intimately linked, all from giving freely that which you are: the full awareness of love’s presence. But this awakening requires that you willingly give up all the ways you have tried to limit and contain her. You cannot guide love’s path, but if you submit to love’s higher vision she will guide you, showing you a new vision of yourself. “True, or unconditional, love is unaware of the strange demands you impose to reserve love for specific relationships. Love is the same for all. Your attempts to reserve love for specific relationships and then withhold it from others is the very thing that has blocked your vision of love’s presence. Give as love gives—just as the sun gives its light to all who ask, or the sparrow that sings not for the one who listens, but for the song itself. When you give love, love is your reward. When you judge some people as worthy of your giving and other people as undeserving, then it is you who is undeserving; not because you have been judged by love, but because you have forgotten love’s law.